Are you considering investing in UITFs? UITFs or Unit Investment Trust Funds are pooled funds offered by the trust department of the major banks of the country. UITFs are very good investment instruments for investors with a longer time horizon and are comfortable with the volatility typical of pooled funds. Pooled funds can be high risk when invested in equities, low risk when invested in fixed income (bonds) or moderate when invested in a balanced fund. Before jumping into UITFs, it is best that you understand the nature of this instrument. Further, it is advisable that you check on the fees associated with pooled funds — they are not all the same. Some funds require entry and exit loads and some funds have higher management fees. Fees will ultimately affect your yields. 2012 was a good year for investments, particularly for equities so it is expected that equity UITFs will do really well. I need to caution readers, however, that returns are not the sole factor if selecting a fund. Aside from fees, it will be good to check on how volatile the funds are, experience of the fund manager and size of fund. Bigger funds are usually less volatile but may not have the best performance. Further, equity funds that are more diversified and having more variety in the fund is generally less risky. Let’s compare two funds even if they are both equity funds — a fund that is invested in only 10 companies might perform better than a fund that is invested with 20 to 30 companies since certain calls are easier to make. However, the fund with fewer companies are riskier since one bad call of the fund manager can have a large impact on the fund. My advise — talk to your bank and do your homework. Regardless, I am a fan of UITFs because in the long run, these investments will help me achieve my financial goals. Personally, I go with bigger sized funds that offers the lowest fees offered by the larger and more stable banks. To know more about UITFs, please read my earlier blog HERE. 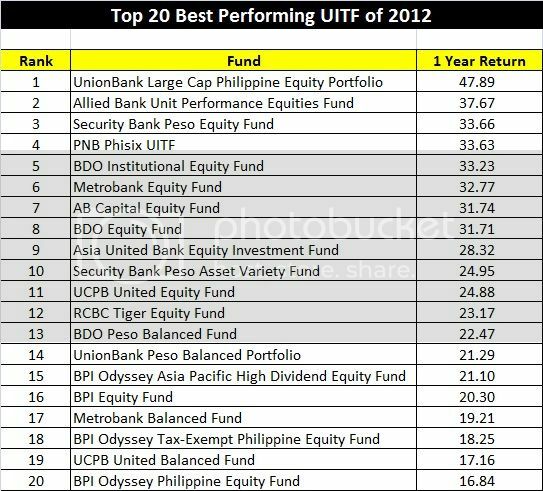 You can also check out performance of Philippine funds at Bloomberg’s SITE. Nice! Thanks for the comparison! I do have a question though. I heard UnionBank (at least I think it’s unionbank) computes their return differently? Like, they have asking price, bid price, etc. And they quote the asking price on their reports, but when you redeem, they use the bid price? Returns are not the sole criteria in choosing a fund. Pay particle attention to fee structure, loads, etc. I’m not sure of the other banks but from experience, BDO and BPI minimum are only P10,000 and both banks even offer a monthly debit arrangement of only P1000 per month. Hi Mr. Randell. Does UnionBank Large Cap have less fees too? Which one is the best considering the returns and the fees? Thanks. May I ask the covered period of the ROI computation? Is it Jan1 to Dec 31? Thanks. hi! how did the philamlife global equity and balanced funds perform in relation to those of the large banking institutions? sir randell bakit po pag nag invest ka sa equity ng BDO equity fund, ay sa ika fifth working day pa makukuha yung certipicate of participation, samantalang nai-debit na yung pero mo sa bank account mo upon investing the very first day ng transaction , ? may I know panu ko po ba malalaman on the same day ung pagtaas ng price sa PSE ng UITF ko? meron po akong large cap placement sa Unionbank.